We went to see Uma Thurman’s new movie, Motherhood, on Friday night at the Kendall Square Theatre. You can see the photos I managed to snap of her during the Q&A session afterwards here. After the movie, Tony and I had dinner at The Blue Room not too far from the theatre. I had read about it on Boston Chefs before but since we don’t normally hang out in Kendall Square I wasn’t eve sure where it was located. 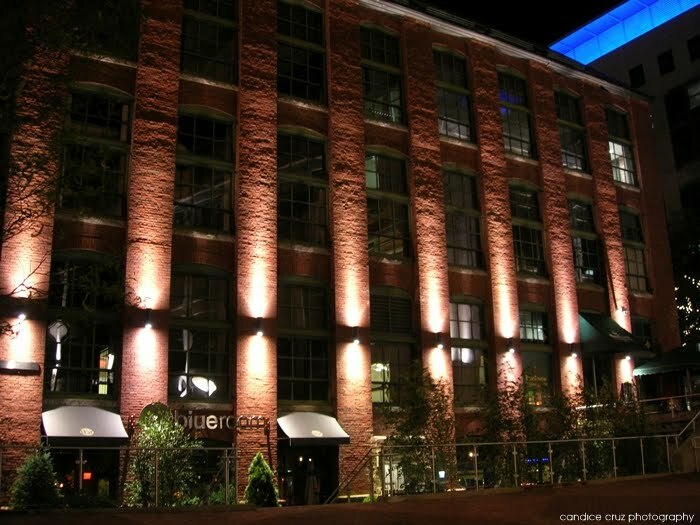 I really liked the outside of the building and how it is lit at night. It has a nice, warm and cozy feeling on the inside as its filled with lots of tables for two, and has a fully open view of the kitchen. The place was packed even at 9:45 pm, which is a great sign. We managed to get a table without having reservations. They print their menu each day and at the botom was this phrase about eating raw food; it was the first thing that caught my eye and made us laugh. 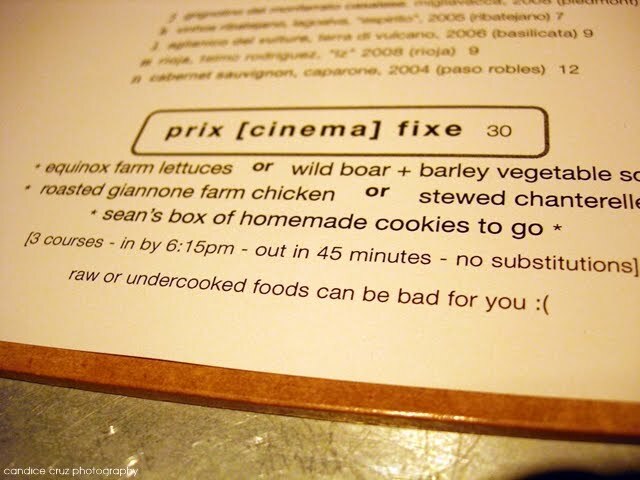 The way that the menu is printed is quite clever actually. It’s all on one page and it includes the wines by the glasses. 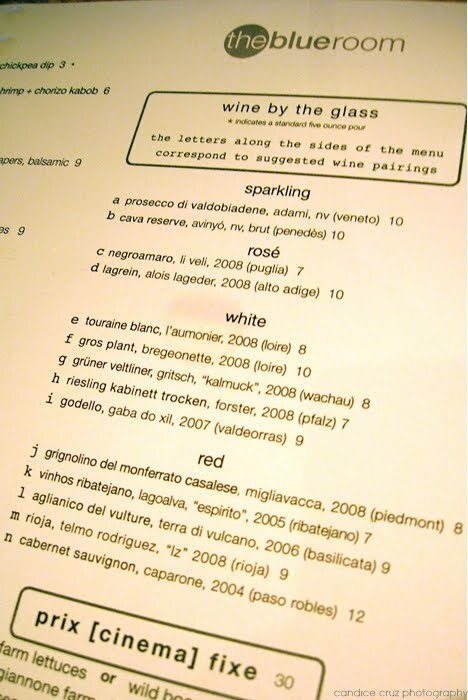 They assigned a letter to each of the wines (starting at the top with the sparkling and white wines, then down to the heavier reds) and then they indicate a suggested wine pairing next to each food dish by using the coordinating letter. We decided to try something different (in hindsight, all of these wines were pretty much new to us which was quite cool) from the wine by the glass menu and we both wanted to try one called Grignolino del Monferrato Casalese, Migliavacca, 2008 (Piedmont) ($8) but I couldn’t figure out how to pronounce it and pointed to it instead. Unfortunately, it was a bit loud in the restaurant and we think that he thought I said we wanted the “Gritsch”. So when our waiter came to the table with a bottle of white wine and said, “I want you to try this,” I totally thought he was giving us a free sample of something. (I’m still laughing at myself for being so naive!) But then after we finished tasting it and said that we liked it, he filled our glasses and then left. We just kind of looked at each other with bewilderment and said, “What just happened here?” Alas, the wine that we ended up with — Gruner Veltliner, Gritsch, Kalmuck, 2008 (Wachau) ($8) — was indeed delicious so we decided we’d get red to go with our meals and not complain. 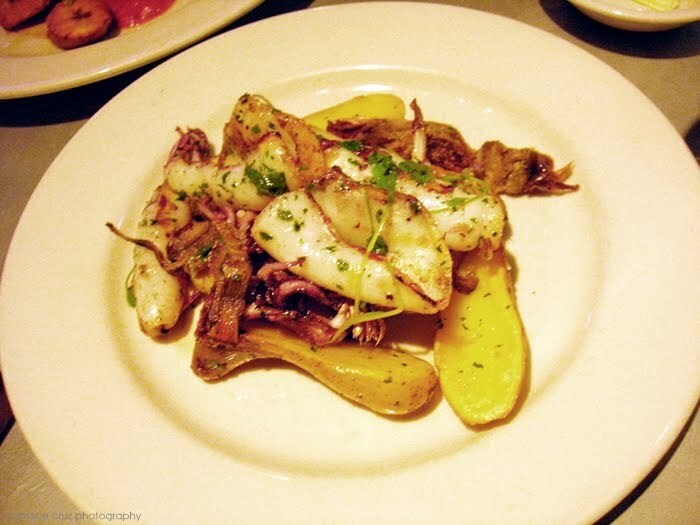 I had the grilled squid appetizer ($9) and asked the waiter to have the chef leave out the roasted red pepper puttanesca (wanted to avoid a trip the ER ya know … lol) and that we’d get an order of the roasted fingerling potatoes from the side dish menu. I think the communication was a little mixed up because they ended up substituting the red peppers with the fingerlings instead of making them a whole separate plate. It really was fine in the end because it was extremely delicious and served with semolina fried artichokes. I couldn’t get over the flavor of the squid and I think it’s now one of my favorite appetizer dishes. The fingerlings went perfectly with them. Mmmmm. I’m craving them as I type this up! I seriously could eat this all day. During dinner, we both asked for the Grignolino again and this time our waiter brought back to the [small] table four empty glasses and two bottles of red wine. The first one he poured was the Grignolino for us to try, but then he poured us a taste of the Vinhos Ribatejano, Lagoalva, “Espirito”, 2005 (Ribatejano) ($7) wine from Portugal. The Grignolino was quite light red in hue and fruity in flavor. Tony stuck with that but I had a glass of the Portuguese wine because I liked how it was a little heavier and bolder. I thought it was a nice little touch that the waiter made thinking that we might like the Portuguese wine, and if anything, we got to try a different wine even if we didn’t end up ordering it. I also liked how they pour your glass of wine for you directly at the table by bringing the bottle over. I don’t know why I like that so much but I felt like it was a like one step up in customer service on their part, plus we were able to sample it before he poured the full glass (which was quite generous, just as an fyi). I definitely want to go back there sometime simply to nosh on grilled squid! I’d recommend The Blue Room to anyone looking for a nice place to take a date and it’s also one of the places I’d like to take my parents to some time when they’re back here in Boston. A nice dinner and date pairing for sure. 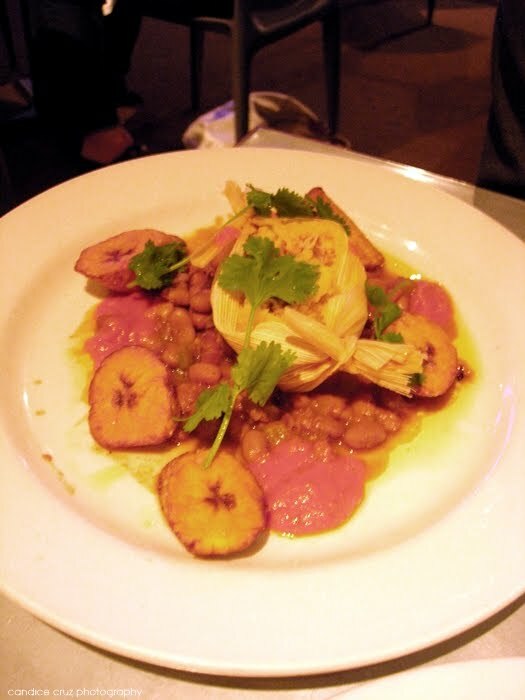 This entry was posted in cambridge, kendall square, restaurant, the blue room, wine by shortcakescraps. Bookmark the permalink. Hey Candice,Thanks for the nice review on the Blue Room. I used to work right around there, and I've always loved that place, but I have not been back there in years. Have you tried their Sunday brunch? It's amazing.